Businesses need a faster, more effective way to deliver applications—and low-code development platforms provide a proven way to shorten time-to-value for new applications. Enterprise adoption of low-code development platforms is surging, but to understand why, we must step back and look at the big picture. Software is eating the world; and in order to survive and thrive, every established enterprise must digitise its products and services, internal operations, and customer experiences. With competition mounting and the pace of change accelerating, the only way to stay ahead of the curve is to embrace new approaches for building custom apps at the speed at which they are demanded. 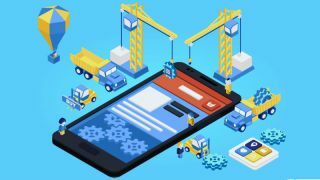 However, according to Gartner, through 2021, market demand for app development will grow at least five times faster than IT capacity to deliver. Products and/or cloud services for application development that employ visual, declarative techniques instead of programming and are available to customers at low- or no-cost in money and training time to begin, with costs rising in proportion of the business value of the platforms. Low-code platforms offer faster, more intuitive ways to build applications, minimising the use of coding by using visual models for defining an application’s data models, business logic, user interfaces, etc. This approach enables a range of users to visually model full-stack web and mobile applications. Professional developers can work much more productively, business developers can actively contribute as part of larger development teams, and citizen developers can easily build prototypes and small departmental apps. Overall, many IT organisations see productivity gains of 10 times or more using low-code platforms, compared to traditional development approaches. For example, a large European energy company is using low-code application development as a means to train non-IT personnel to contribute to the application development process. Every quarter, the company trains about a dozen new employees on how to build applications using low-code application development and encourages them to then develop custom applications that will improve the operational efficiency within their function of the business. As a result, the company has built more than 50 applications in the last two years. That level of scale was only possible with this new approach of including more people in the application development process. One tedious and time-consuming aspect of application development is manually coding the same functionality over and over. Productivity can be further accelerated with low-code development platforms that promote reusability through an app store populated with out-of-the-box templates, widgets, plug-ins, business components, and connectors to emerging technologies. The platform may also offer a private app store, whereby an organisation can distribute company-specific IP for reuse across development teams. In either scenario, building apps becomes more like visually “orchestrating” the necessary building blocks, versus reinventing the wheel each project. One organisation that reuses components to speed up application development is a mail and parcel delivery organisation. The company is using low-code application development to build a brand-new core system to manage the reliable delivery of all parcels and mail. This will enable shifting of resources between conventional mail and parcel delivery as the nature of its business changes. The system of applications will manage the timely, reliable delivery of millions of packages per day and is comprised of hundreds of independent services including track-and-trace applications, delivery scheduling, and parcel sorting, re-used across a distributed footprint of distribution centres. By re-using these services, rather than building them from scratch for each application, this organisation can substantially accelerate time to value, and ensure a highly-robust core system where independent services scale independently as they are needed. Focusing only on the build phase can leave you high and dry when it comes time to deploy and manage your application. As such, low-code development platforms must support the entire app lifecycle: design, build, deploy, manage and iterate. These platforms usually include collaboration tools, agile project management, automated deployment, application governance tools, and user feedback loops. This is an important part of the time-to-market advantage, with a seamless way to move apps along the lifecycle, particularly in terms of deployment. For complex applications, the ability to scale is a high priority. Certain low-code development platforms offer the flexibility to deploy and manage applications in the cloud of your choice, or even on premises. Offering automated deployment along with a cloud-native, stateless architecture enables out-of-the-box high availability and fail over to support web-scale deployments. The aforementioned mail and parcel delivery organisation is taking a cloud-first approach to its new core system. With a set of hundreds of services that scale independently, cloud hosting offers this organisation the flexibility to scale horizontally or vertically at will, increasing the resiliency of this mission-critical project as the demands on these services crest and fall. Additionally, by using a Cloud Foundry based hosting environment, this organisation is exploiting a cloud that is fully-managed, robust, and highly available out of the box. The fundamental value of a low-code development platform is that it brings IT and the business together, enabling more rapid, iterative, and collaborative development. Applications can be rapidly built, seamlessly deployed and easily changed—all without the need for low-level coding. In addition, these platforms provide an excellent communication mechanism to align business and IT stakeholders, thereby ensuring greater software quality and more successful business outcomes.